Tha Seattle (uaireannan "Siatail"), na bhaile mòr ann an stàit, Na Stàitean Aonaichte. 'S e 573,911 àireamh-shluaigh a' bhaile fhèin le King County a toirt a-steach mu 1,737,034 gu lèir. Tha an Oilthigh Washington suidhichte ann an Seattle. Chaidh am baile a stèidheachadh ann an 1850. Bill Gates (1955): Eòlaiche Choimpiutair. 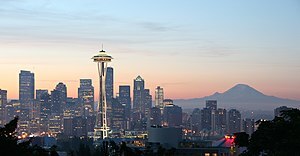 Air a tharraing à "https://gd.wikipedia.org/w/index.php?title=Seattle,_Washington&oldid=529650"
Chaidh an duilleag seo a dheasachadh 13 dhen Ghiblean 2017 aig 03:16 turas mu dheireadh.